The genealogy of the Corte Real family dates from 1 367, beginning in the city of Tavira, in the Southern Province of Algarve. It is believed that the name “Corte Real” was originally a nickname given because these nobles were always to be found in the “Corte Real” or “Royal Court”; another version relates that the surname was given as a title because the family had distinguished itself in many royal services. The Cone Real family was always very close to the Royal House and there fore took an active part in the conquests in North Africa as well as in the progress of the discoveries. The earliest documents connecting the Corte Real family with the Azores Islands are the charters of February 17, 1474 and April 2. 1474 granting João Vaz Corte Real, father of Gaspar and Miguel, the governship of the Island of Terceira. The first charter clearly in dictates the division of the island of Terceira between João Vaz Corte Real and Alvaro Martins: and thus the island divided, I ordered João Vaz Corte Real to choose first, and he chose the part of Angra, and left the part of Praia for (Alvaro Martins) . .“ The second charter confirms the division of the island, and the rights of João Vaz Corte Real to administer justice and maintain the general welfare of the people. Infanta Dona Beatriz, acting on behalf of the grandmaster of the Order of Christ, divided the governorship of the Island of Terceira into two countries: one comprised the Southeastern part known as Angra, chosen first by João Vaz Cone Real, who was to be favored by the division; and the other half, known as Praia, was accepted by Alvaro Martins Homem. J oão Vaz Corte Real wanted to establish himself in the Island of Terceira because he knew the favorable geographical position of that island in the North Atlantic. The navigators accurately calculated that Terceira was situated on the same latitude as Lisbon — 38° 40’. João Vaz Corte Real had landed at Terceira in 1472 after he returned from the land of Bacalhaus (Codfish) or Newfoundland. Corte Real wished to have a navigational outpost and also more income to further finance the search for the Northwest Passage. Indeed the island of Terceira became the center from which many voyages radiated out into the Atlantic for the purpose of exploring the Americas. On May 4, 1483, Dom Manuel, grandmaster of the Order of Christ and later King of Portugal confirmed the Chart of 1472 given to João Vaz Cone Real for “the many services he performed for Prince Henry”, and in addition gave him the Island of St. George. For almost 25 years João Vaz Corte Real continued to explore the North Atlantic, at the same time sharing his experience of navigation with his sons. When he died, in 1496, he left to his sons the governorship of Terceira and St. George, and also the fruits and legacy of his explorations. We know that Gaspar Corte Real was successful in his voyages because King Manuel I (January 27, 1501) gave a letter of promotion to João Martins for his outstanding participation as a crew member in Gaspar Corte Real’s voyage to Newfoundland. The King’s letter, or Royal chart, is dated January 15, 1502, and is in the Torre do Tombo in Lisbon. As a result of the official policy of secrecy, Gaspar Corte Real did not leave any document describing his voyage to North America. 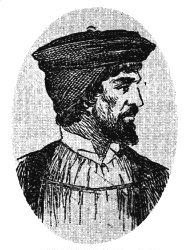 In spite of this, we have the letters of the Italian spies, Alberto Cantino and Pedro Pasqualigo, written in Lisbon (October, 1501) describing in detail the voyage, the land, and the people encountered by Gaspar Corte Real. These letters are self-evident and are here presented in their entirety. Hello, i am interested in your information regarding to the Corte Real family because I am trying to understand where Jeronimo Corte Real fits into the family and how he came to own part of the island of Sao Jorge. I tried to email you at the link given, but could not. I would appreciate any insight you could give. Thanks for posting an article about these two Corte Real brothers. I am also compiling a brief biography of some of the world's most famous explorers. Find your site very helpful to me. Thanks!